A fantastic feature of many weddings is hosting a cocktail hour between the ceremony and the reception. This gives the bride and groom time to take wedding photos with the bridal party, and it also gives guests a little extra time to chat and transition before the dining and dancing begin at the reception. Read on in today’s blog from The Alleen Company to find out must-haves for your wedding cocktail hour! Nothing says class and sophistication quite like a signature cocktail at your cocktail hour. Whether it’s a favorite drink that already exists or a new creation of your choice, having a signature beverage is a fun way to personalize the moment. Make your signature cocktail match your unique personality, as well as the theme and the color palettes of your wedding design. There are so many fun options when it comes to planning your drink menu! Be creative and have fun! 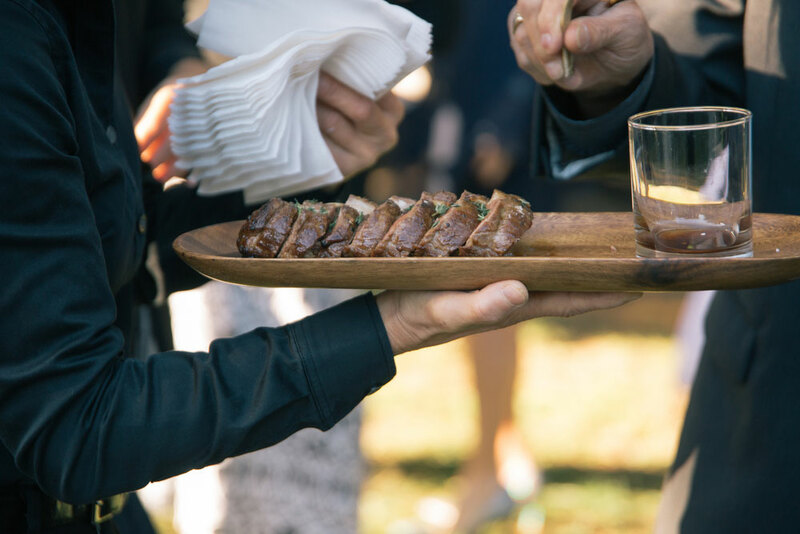 Though you will most likely have a full dinner at the reception, you should consider providing your guests with some light hors-d’oeuvres during cocktail hour. Offer your guests a few savory and sweet snacks that are easy to eat and complement your signature cocktails. Part of creating an atmosphere during your cocktail hour will be setting up comfortable and cute seating areas where your guests can enjoy conversation and drinks. Having tall tables draped in lovely linens where people can stand is a great option. We would suggest adding lounge areas as well, where your guests can sit together comfortably. You can also opt for small tables and chairs to create a café-like atmosphere. Whatever you choose, make sure that the space is inviting and festive! Linens are an essential part of creating texture and depth in your décor. Adding them to your cocktail hour venue will tie it into the theme of your overall wedding décor. In addition to tablecloths, linen napkins add a sense of sophistication to your cocktail hour. If you’re planning a wedding and find yourself in need of an event planning and rental company, then look no further than The Alleen Company. The Alleen Company is the premier rental and event planning company in the Cincinnati area, and we have been in the business for 65 years. At The Alleen Company, we have a rental catalog on our website with everything from linens to lighting. Feel free to browse our selection and contact The Alleen Company today to find out how we can help you create the perfect cocktail hour for your guests!